Your account settings contain all information that are visible to other members and can be edited at any time. In addition, you can define which email notification shall be sent to your inbox. Click on your name / profile picture in the lower left corner to open the menu and select "Your Account...". Subsequently, a new dialog box will be opened in which you can edit the settings. You can deposit information about yourself, such as your phone number or your position within the company. We recommend to upload a unique profile picture, otherwise there will be times where it's hard to distinguish all members of your organization at a glance. 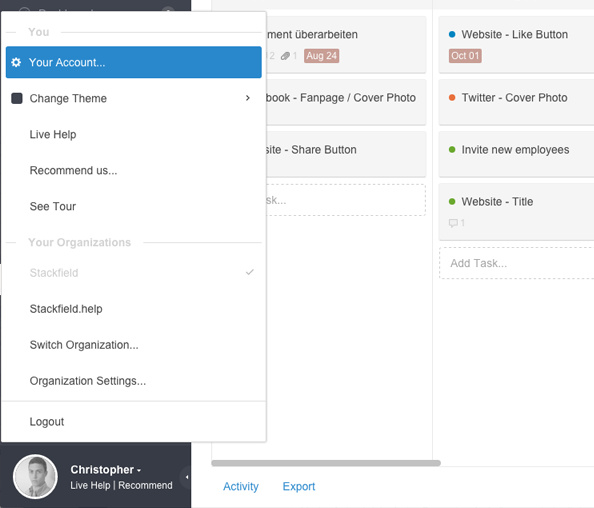 The section "Login" contains the options for changing your email address and password. After changing the password, you will receive an email with a confirmation link that must be clicked so that the change is carried out. 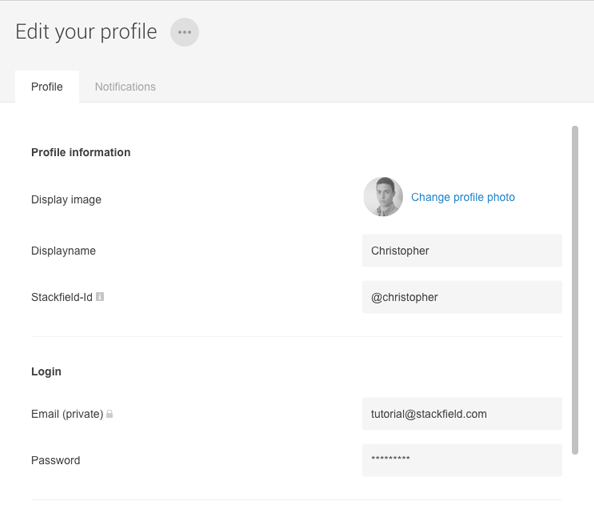 Your profile information in the account settings. 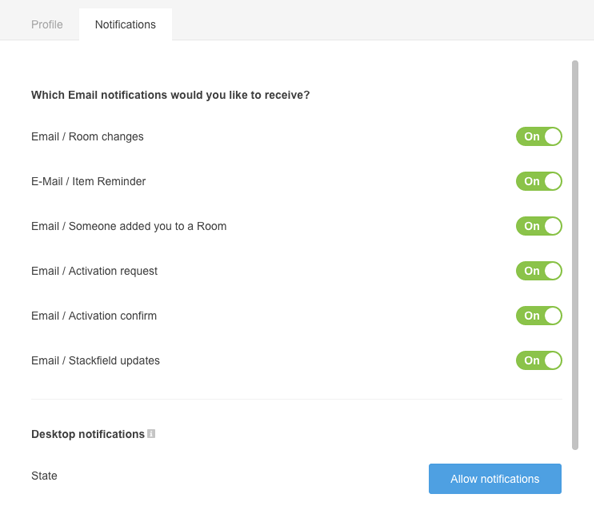 The settings for notifications are divided into two categories. On the one hand there are email notifications, on the other hand you can activate desktop notifications for each browser. Latter must be activated separately for each browser. Notifications of any kind can be enabled or disabled. Activate the desktop notifcations by clicking on "Allow Notifications". 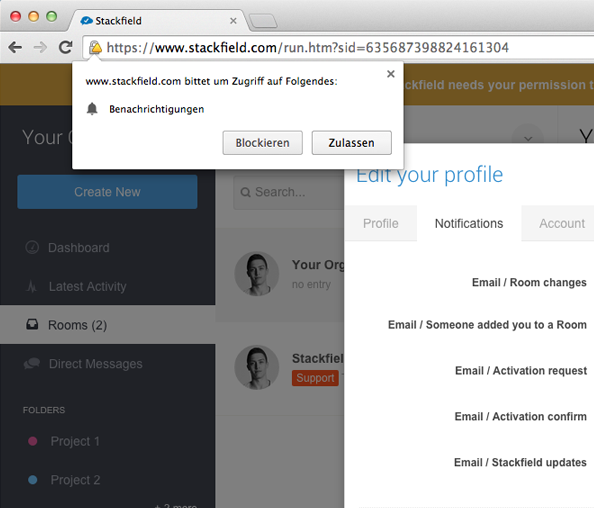 IMPORTANT: Your browser will ask you if you want to allow these desktop notifications by Stackfield. You must accept this request in order to receive notifications and it needs to be done for each browser separately if you are using more than one browser. Depending on your browser, you may need to decide how long this decision is valid. Enabling desktop notifications in the browser.